Matthew Broad was waiting at Reading station for a train that it seemed would never arrive. "I was miffed. But then came the familiar excuse - signal failure. It's a term with a certain mythical quality, often referred to, but rarely explained." So Matthew, who regularly commutes from Oxford, wrote to the BBC to ask us to find out more about what "signal failure" actually means. "My train is often delayed because of 'signal failure'. But what exactly is this? Why do they go wrong? And what can be done to stop this?" he asked. Matthew isn't alone in being plagued by incidents of signal failure. Last year in the UK there were more than 19,000 incidents that caused delays of 100 minutes or longer. Railway signals are traffic light devices that tell a train driver if it's safe to proceed along the track. As on the roads, a driver shouldn't pass a red light. To stop trains hitting each other, tracks are divided into sections. Only one train should be in a particular section at any time and signals are positioned at the beginning of each one. But sometimes these systems break and the signal turns red even when there is no train in the section. Signal failure refers to various things that go wrong, causing a train to be held up at a red signal. The stationary train quickly creates knock-on delays. Problems with track circuits and axle counters which are used to detect if a train is in a section are common causes. A track circuit is a small current running between the tracks and trains and an axle counter measures the track wheels going in and out of a section - if the numbers match, the section is clear for the next train. But track circuits are susceptible to rain - not uncommon in the UK - causing corrosion, while axle counters don't respond well to heat and sometimes require a manual reset. Cable theft along the tracks and track points failure (the moveable bit of rail that enables trains to switch between tracks) also cause signal failure. At its peak, copper cable theft cost Network Rail up to £16m a year. In the UK, the state-owned Network Rail is responsible for the upkeep of railway track and infrastructure, while private train companies operate the trains. Despite being different organisations they have to work closely together to resolve issues. "We are in the hands of Network Rail completely," a duty control manager at one of the largest train companies told the BBC. When signal failure occurs, it becomes "hard to predict timescales", he said. "When a person is struck by a train, we get to work on reopening the line in 90 minutes, and everyone knows what the task is. With signal failure it can be a piece-of-string estimate. While it's not about passing the buck, it can be frustrating for us, getting a bad reputation because a Network Rail system has failed again." 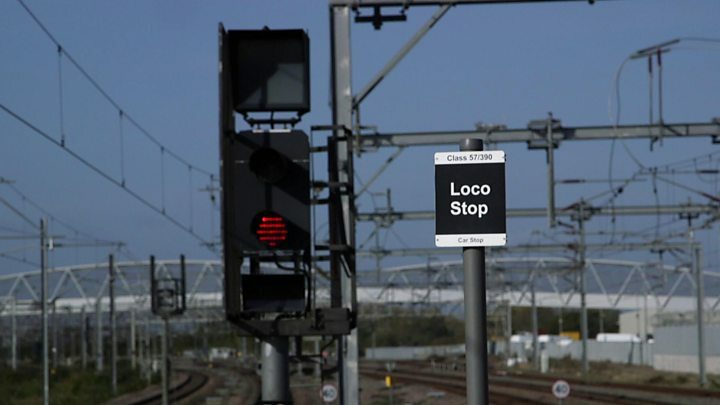 Signal failure may frustrate passengers but the fail-safe nature of the system is part of the reason for the UK's high safety record. The last fatality as a result of a crash was in 2007. "Safety comes first in everything," says Tony Miles of Modern Railway Magazine. "I'm sure passengers would rather signals go red so teams can check out what's wrong." Martin Jones, chief control command and signalling engineer, is responsible for reducing signal failure on Britain's railways. "We are a lot more reliable now than a few years ago. As we modernise our systems we tend to have control of larger areas, so failure can be worse when the system goes badly wrong. However, it gives us the conditions to monitor equipment more proactively." Mr Jones said monitoring enabled equipment to be fixed before it went wrong, preventing signal failure. Currently around two-thirds of track points and 40% of track circuits have been fitted for remote monitoring. This investment in remote monitoring should help engineers locate problems caused by rain and heat before they cause a signal to fail. Mr Miles says mobile maintenance teams need to be more widespread across the country. "Even in the digital age you still need people on the ground," he added. One hope is that Britain will move to a digital moving block railway. Similar to modern air traffic control, this would dispense with the need for trackside monitoring equipment. More precise monitoring of a train's location would also free up capacity for more trains on the network. However, this system is still years away - not much consolation for Matthew while waiting for his train. So what does Matthew now think? "It's reassuring that Network Rail have acknowledged reliability can be improved and that they are going out of their way to help make the system better. "I'm shocked though that such simple things as rain continue to cause problems. "It's interesting that Tony Miles mentions how teams more widely dispersed along the rail network would be able more immediately to respond to faults. As with the digital moving block railway, I suppose it's a question of money. And in an era of cuts it's not clear whether there'll be any more available."